If I hear anything, I’ll update here too. UPDATE: The LA Times had a fuller report of the evening (and Beck.com wrote it up too). Apparently, they played 4 songs. Initially, Devendra sang his song “At The Hop,” I’m not entirely clear if Beck was involved there (Beck.com seems to say he was, but LA Times seems to say it was just Devendra). After that, Beck and Devendra and the string section did “The Golden Age,” a video clip of which is in the comments below. 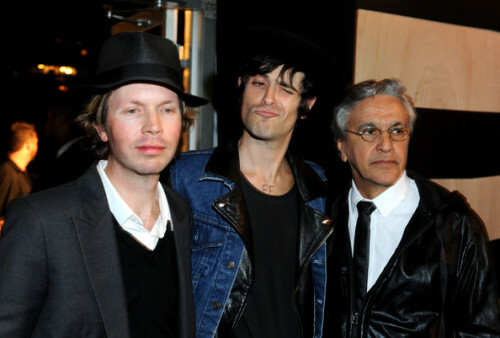 Next, Caetano Veloso joined them and did his songs “Nine Out Of Ten” and “Maria Bethania.” Afterwards, there was a performance art piece by Doug Aitken called “WE” and Beck apparently participated in that somehow. The piece included drummers, auctioneers, and a guy with a whip. You are currently browsing the archives for the Beck category.